Good afternoon everyone, it’s been a while. You all remember that movie “Angels in the Outfield” with that kid that could see and use ghosts to help the California Angels win games? Well I hear they are making a sequel in 2018, and I heard it will be called “Yankees in a Crowded Outfield” with the ghosts of Yankee Stadium helping to terrorize the rest of the American League, especially the Boston Red Sox. Now while the movie and movie title are a bit tongue-in-cheek, the fact that the New York Yankees have a crowded outfield (and ghosts that will hopefully continue to terrorize the Boston Red Sox) is not. The outfield is overcrowded with Brett Gardner, Aaron Hicks, Aaron Judge, Giancarlo Stanton, Clint Frazier and Jacoby Ellsbury possibly all on the active 25-man roster, although Frazier is likely to start the season in Scranton in Triple-A, and the Yankees may need to address this over-population sooner rather than later. The good news for them is I have a plan; the bad news is this may not be one of my most popular blog posts from this offseason and spring. Before I put forth my idea to clear the logjam I will preface this post by saying that the Yankees have a plan, and that plan has already been put into place by Aaron Boone and his staff this spring. Reggie Willits, a newcomer to the Boone staff and to the Yankees coaching staff this season, is already working with both Judge and Stanton in left field this spring with the hopes that either could play there in a pinch this season. The team has also left the designated hitter position open with the hopes of rotating their outfielders in and out of the position to not only get everyone at-bats, but to give the players a half-day off as well. It is also worth mentioning that Judge has reportedly spoken with and asked manager Boone about playing some center field in 2018, an idea I am admittedly not really keen on personally, giving the Yankees yet another option to help with the logjam. Unfortunately, I do not think this will be enough and there will always be one or more players on the outside looking in so here are my ideas on how the team could clear up the clutter. 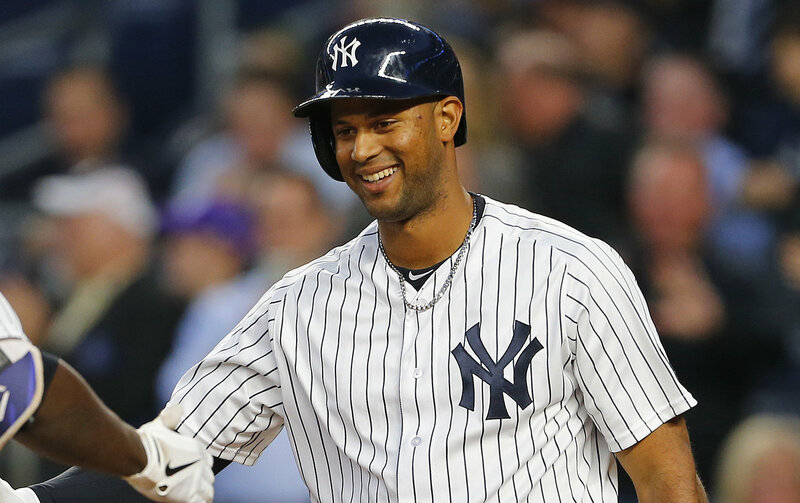 The team tried, and reportedly failed, to trade Jacoby Ellsbury and his three-years and $68 million left on his contract all winter long so why not try and trade the man that replaced him instead, Aaron Hicks. I know this won’t be a popular decision as Hicks did well in 2017 posting a .266/.372/.475 triple slash with 15 home runs in 88 games, but desperate times call for desperate measures. Honestly, I cannot see the value for Hicks getting any higher than it already is and as much as I would hate to lose the switch-hitting center fielder, it may make the most sense for the Yankees this season. The production from Hicks is replaceable, in my opinion anyway, by having Clint Frazier take over center field, something he did with the Cleveland Indians and New York Yankees as a prospect and something he could do again until Estevan Florial is ready, while keeping Jacoby Ellsbury on the bench. Trading Hicks could bring back a significant piece, especially if packaged with a prospect or two, to the pitching staff as well as a little bit of salary relief and roster space. It isn’t ideal losing Hicks, I admit that, but in my opinion, it isn’t ideal having Frazier down in Triple-A with nothing to prove either. That’s when bad attitudes and bad practices occur with a player, see Jesus Montero as a recent example of this. Trading Ellsbury would be ideal, no one would argue this fact, but for most of the same reasons the Yankees want rid of him other teams wouldn’t want him and his salary either. And don’t even get me started on his no-trade clause and his seemingly unwillingness to move it. More on that and bad journalism at a later time, I feel a rant coming on, but until then moving Hicks may make the most sense for the New York Yankees here before the 2018 season. I’m not sure where I would like to move him, or for who, but a move involving him just makes sense right now. With that said and with the World Series in the Yankees sights I want to win at all costs. Sites like mytopsportsbooks.com has the Yankees' odds to win set at +550, just behind the Dodgers (+500) and level with the defending champion Astros. Agree? Disagree? Leave it below in the comments. Good points re Hicks. Its a risk but I too would take my risk on keeping Frazier. If Ellsbury has a good spring training the Frazier risk is less as they can platoon. Hicks for a good pitcher is trading from strength. I have advocated Hicks being packaged instead of Frazier for Cole, so including him for any other starting pitching is a good idea. How about Hicks, Andujar and Adams for Fulmer from Detroit. Platoon Frazier and Ellsbury in CF until a trade partner can be found for Ellsbury. That's a lot for Fulmer, but I'd probably do that. I have a trade idea for Andujar, I just haven't posted it yet. Adams def has his question marks, adding a third pitch, control, command etc., but I think Adams can be a serviceable starter, and much better than a 5th guy. So many forget that Adams was drafted as a relief pitcher and was converted to a starter. Of course his development is a tad behind most at Triple-A, most of them have been starters all their lives, or at least longer than Adams has.